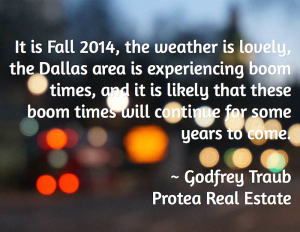 It is Fall 2014, the weather is lovely, the Dallas area is experiencing boom times, and it is likely that these boom times will continue for some years to come. New apartment complexes are springing up all over the area. Older complexes are being renovated and new office buildings are coming out of the ground in several areas. In downtown Dallas new hotels, condominium high-rises and parking buildings are planned, and new retailers are about to open. Far North Dallas is booming beyond all expectations. International Business Park will soon be the new home for Reach Local, and Toyota and Fedex will be moving into Legacy Business Park, where Toyota alone will be employing 4,000 employees, of which about 2,500 are expected to relocate from other states. The City Line development will be the new home of State Farm Insurance and Raytheon, and these companies will bring about 13,000 employees to the area. The City of Frisco announced recently that it needs to construct 4 new high schools almost immediately. The State of Texas is the envy of the world and an example to be followed by other states. Its government has been and is fully committed to encouraging business. Texas residents pay no state income tax, and all of this helps to keep the cost of living of its residents relatively low.